David Gray’s first album, “A Century Ends”, was released in 1993, followed by “Flesh” in 1994. After touring with the likes of Radiohead and the Dave Matthews Band in support of his third album “Sell, Sell, Sell”, David decided to self-finance his fourth album, “White Ladder”, and release it on his own label, IHT Records, in 1998. As David’s success grew, he released a pair of compilations (“Lost Songs 95-98” and “The EP’s 92-94”) and reissued “A Century Ends” and “Flesh”. “A New Day at Midnight” followed up his successful international breakthrough in the fall of 2002, and 2005’s “Life in Slow Motion” debuted at the top of the charts in both Ireland and the U.K. In 2007 he released “Shine: The Best of the Early Years”, followed by “Greatest Hits”. Most recently, David released “Draw The Line” in 2009, “Foundling” in 2010, and “Mutineers” in 2014. 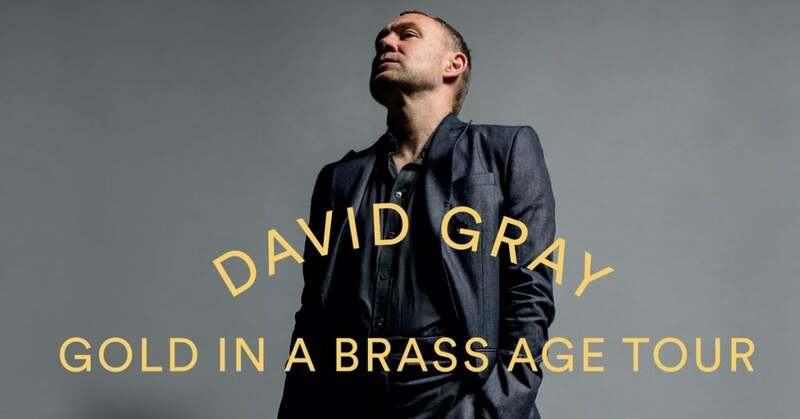 In 2016, “The Best Of David Gray” came out in a standard and deluxe format. During the span of his career thus far he has had 12 million album sales, the best selling album in Ireland ever with White Ladder, a BAFTA nomination for his soundtrack work on Amma Assante’s 2004 film ‘”A Way Of Life”, two Ivor Novellos, a Q award, two Brit nominations, and a Grammy nomination. Golden In A Brass Age – new album out March 8, 2019.